Designing a home from scratch can be a challenge—having to contend with two varying aesthetics is an entirely different feat in itself. Such was the case for Jordan Winston, design director of Oxford Design Exchange, whose latest project took on the form of a new build earmarked for a young couple moving into their first home together. Capturing their individual personalities, all the while fostering their new life together, was of the essence—incorporating a request for a patio large enough for a dance party was also on top of the to-do list. Throughout the home, you’ll find subtle hints of the couple’s distinctive styles, seamlessly integrated by way of a mix of the traditional and modern. In the living room, Winston introduced a handful of timeless pieces—such as an extra-long English arm sofa and a deep Chesterfield sofa—to establish a space that was centered around conversation and gatherings. “The antique teak stools and the silver-clad coffee tables add texture and edge to contrast with the traditional,” she adds. The kitchen manifested itself as an opportunity for Winston to get creative with materials and color. In lieu of sticking to one metallic finish, Winston opted for a warm mix of them to contrast the marble surfaces in the room. Copper pendants were brought in to visually frame the brass-detailed hood, and matching hardware was installed for an added dose of polish and contrast. “We wanted the range and hood to be the focal point,” she recalls. 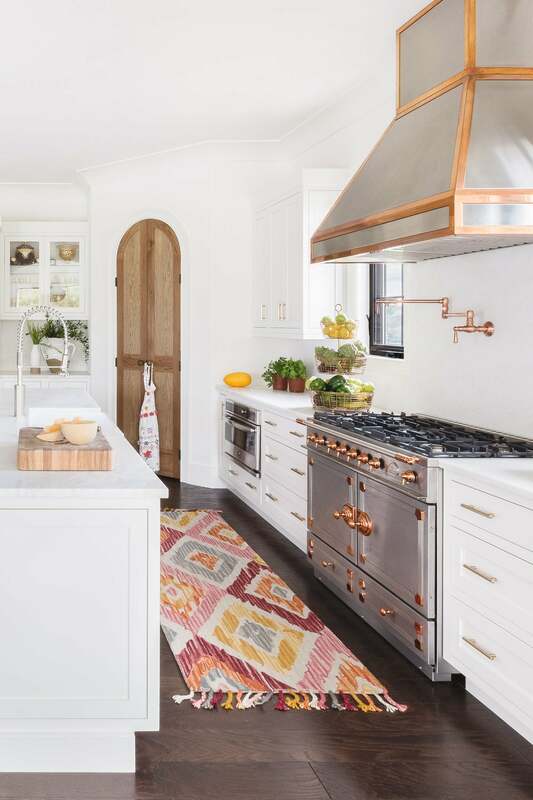 “The beauty of copper is that it patinas and ages beautifully, avoiding a ‘too perfect’ kitchen and gives you the opportunity to mix metals.” The dark flooring invites a subtle hint of color to the all-white kitchen, sans clashing with the surrounding chromatic accents. When it came to designing the bedrooms, an emphasis was placed on giving the spaces a fun and fresh perspective. In the guest bedroom, the lounge chair and bed were two of the newer pieces, which Winston countered by accessorizing with art and vintage furniture to lend a sense of depth and character. A whimsical high-back chair, sourced from Chairish, was reupholstered in a large-scale palm print, inviting a bold dose of color to the otherwise muted scheme. The sporadic use of pattern throughout was Winston’s key approach in seamlessly blending varying decorative styles. As the construction period of the home was spread throughout the course of an extended period of time, Winston was not only able to witness the couple get engaged, but she also saw them get married and become parents. Naturally, this called for the addition of a proper nursery—one that came with pattern and texture. Set against a neutral backdrop, the intention of the space was to remain calm and to foster creativity—the latter was achieved by way of the whimsically illustrated, animal-print wallpaper. While every redesign will inevitably come with its fair share of challenges, the one that Winston faced with this particular one fell in line with creating a home that would be a reflection of the couple today, as well as who they would grow into being in their later years. “We tackled it by choosing sophisticated and authentic materials throughout the home—brass, copper, and marble. Materials that only grow better with age,” Winston notes. In the end, the home came to embody just that.